Kicking the drug abuse habit or any other addiction is a major accomplishment. But for most people with opioid addiction, detox is only the beginning of a long-term battle against craving and relapse. Counseling is an essential part of addiction treatment for many people. Cognitive behavioral therapy, family counseling, and other therapy approaches can help people recovering from addiction stay clean. Psychotherapy can also treat the other mental health conditions that often contribute to addiction. 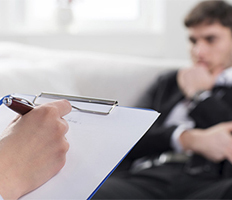 Why Counseling Is Important in Addiction Treatment? Social networks, like spending time with friends who continue to use drugs, alcohol and tobacco. These factors can create ongoing, nearly irresistible urges to use various substances of abuse. Counseling helps addicts escape craving and learn to cope with life, without falling prey to addiction. Several counseling therapies are available for prescription drug abuse, and no method is known to be the best. Likewise, no one approach is appropriate for everyone with addiction. The Navicare doctors will design personalized counseling & treatment plan to cater to the individual’s addiction problem. Our trained counselors will come to your home or a location of your convenience and offer counseling services. We offer home based counseling for the patient & the family. You can visit our clinic where our trained counselors can offer individual or group counseling sessions for both the patient and the family. We understand your need to connect with your doctor from anywhere. Thus, Navicare offers exclusive web-based counseling services for your convenience. Book a session soon. While any counseling therapy for drug abuse treatment is better than none, group therapy is generally preferred over individual therapy. In group therapy, a person is more likely to be both challenged and supported by peers who are also going through drug rehab. Individual therapy can be helpful in the case of a dual diagnosis: coexisting depression, bipolar disorder, or other significant mental health condition that requires treatment in its own right, separate from the opioid addiction. Family members can act as a powerful force for change in the addicted person|s life. Each family member can begin to heal the damage their loved one|s addiction has caused in their own life. Studies show family therapy results in lower relapse rates, increased happiness in the family, and better functioning in children of addicted parents. At Navicare we offer both Group and Family Counseling. You can view our time-table for the Group Counseling Sessions for the respective addictions and book your appointment. Guidelines: Please note that this is on first come first basis, so making a prior booking will be advisable. The maximum number of persons per group is of minimum 3 and maximum 7. The session will be conducted for 90 minutes. We advise for Family Counseling the families can also book an appointment on the day the doctor is scheduled to visit to see the patient. For more information call our toll-free helpline 1800-419-0702.